In February last year I had an email exchange with D. Marshall Burns. He was working on a game called The Rustbelt. I had just started thinking about the idea of breaking games into three parts Rules, Setting and Form, instead of the old way of just Rules and Setting. The Form was something magical that answered question of what a game actually played like, what implicit rules were assumed for the interactions around the table, and so on. How do you actually play a game? I read the draft, sent some feedback and we discussed the Form of Rustbelt, then nothing happened for a while. I forgot about the whole thing, started a blog with game reviews covering games as if they were built from the three parts Rules, Setting and Form. Then Marshall posted about a pre-order on StoryGames, I ordered, and then, half a year later, I got a package in the mail. 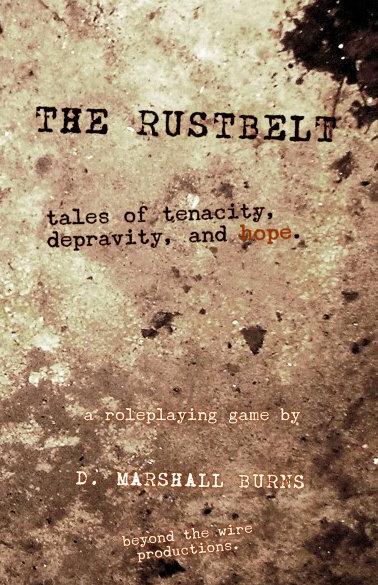 The Rustbelt, complete with a pre-order only CD with Rustbelt music. The 160 page book is a bit smaller than the usual 9×6 format, perhaps digest sized? Marshall has dome everything except the editing himself, including taking the B/W photos that are used for illustrations. The layout leaves enough space for the text to read easily. But the high level of the language made it take an whole evening to read. I speak English as a second language, and even if I didn’t need to break out the dictionary it still threw me off the track a few times. A nice read anyway. The setting in The Rustbelt is sort of a slow apocalypse in the making. Life here is nasty, brutish, and short. The Rust slowly eats everything away. It wears a man down. Corrodes him. Changes him. Makes him do things he wouldn’t think himself capable of. If you had to, wouldn’t you? The Rust, a mystical power that corrupts everything, eventually, is the apocalypse in the game. Technology fails and people fail. The world is a nasty place and the game is about the people that have to live in it. If Summerland was the apocalypse envisioned by the BBC, The Rustbelt is the apocalypse by HBO, or possibly Quentin Tarantino. The rules are all about choice. Roll to make an action, the dice say you fail, would you still like to succeed? What would you pay to make it so? The characters have three pools, Blood, Sweat and Tears, to draw from to push failed rolls into successful ones. No skills, a character is assumed to know whatever is reasonable for his background, but stats, Tough, Savvy, Grizzled, Slick, Thorough, Personable, Cagey and Uncanny. Nice stats, eh? All characters also have Hunger (What they really want. ), Vice (Stuff they fall back on to cope. ), Faith(s) (Stuff they believe in.) and Woe(s) (Stuff they regret, and that gnaws on their minds.). Everything seems geared towards sending the characters into a downward spiral of pain and misery. This is not a happy game. Combat? Well, you could attack, or defend, or do anything else. See that? You have to choose, you can’t do both. Traditional GM, who actually is supposed to do prep after the characters have been generated, and players. There is a section with advice for the GM, most stress the importance of always offering the players a choice. And player advice, mostly that they should expect bad things, and live with them since they make for interesting stories. The setting is good. There is enough to build games around, but not much in the way of reading material. The players are supposed to build their own setting before playing, with the Rust as a factor in the background. Having seen some postapocalyptic movies before playing helps. The rules are good, or possibly excellent, I’d need to actually play the game to decide. But they do the job, they will support stories about people who face tough choices, and what those choices cost them. The form is good. The game is clear on how to play it, and offers some examples in the text. I’d love to! Can I find a group for playing it? That might be a bit hard to do, and I wonder if it would suit itself to con gaming. The players should invest in the characters to make them really pop. www.angelfire.com/indie/btw/ – Beyond the Wire Productions, the official site for The Rustbelt. At the time of writing it has been corrupted by the Rust, and you can’t buy the game there. marksman45.wordpress.com/2010/08/10/the-rustbelt-pre-orders – Marshall’s blog post about the pre-order of The Rustbelt, shows a few pages from the book among other things. When I read Traveller a while back I wrote a bit about the OSR, people going back to playing old school games, or making new games with the same feel as the old games, mostly D&D. My experiences with the old school of D&D are pretty limited. I played red box D&D once, my character was an elf, who died of poisoning after less than an hour of play. We never came back to D&D after that, but we played some 2ed Ad&d, and when I was at the university I played a bit of 3ed D&D. But lately I have had an interest in trying old school D&D again, just to see what I have been missing. The game comes in a box. It has been a while since I last bought a boxed game, boxes are expensive to make, and makes for more expensive games. It is not the usual two part box, but an elaborately cut and folded single piece one. I doubt that it is as durable as the old style of game boxes, but I suppose it is a while lot cheaper. Inside the box there are dice, character sheets, a pencil, hex and graph paper, a Tutorial book, a Rules book, a Referee book, a Magic book and two adventure books. Lots of stuff, everything in A5 format. The box cover art by Cynthia Sheppard is great, and it is also used on the Rules book and the Referee book. The rest of the illustrations are by a whole horde of artists, and are of average quality at the best. There is not much in the way of setting in the game. The two adventures have setting, but they are sort of separate from the game itself. It supports the generic fantasy medieval stuff with elves and wizards. The PCs are supposed to be given some sort of reason for heading down into dungeons to bash monsters, solve riddles, survive traps, loot riches and gain experience. The traditional six stats 3-18, and a class (Cleric, Fighter, Elf etc) make the basis for a character. Buy some equipment and possibly hire some henchmen and the PCs are ready to go questing. Levels up to 20 are covered. Combat is similarly simple on the surface, roll a d20 higher than the opponent’s armor to hit, then roll the weapon’s damage and subtract that from his hit points. But there are special rules for a number of situations that give the system some tactical depth. There are subsystems for ship’s combat, owning slaves and property, and other things useful when the characters have gained enough money. One good way to make money seems to be to buy cartloads of spears at 1GP each, have a hireling tear off the blades, and then selling them as staves at 5GP each. The form is traditional, one GM (called referee) and a set of players. Dungeons are explored and mapped on a room to room basis, monsters bashed along the way. But it is not assumed that the reader is familiar with this play style, the whole first book, Tutorial, is dedicated to explaining it. First through two simple solo adventures, the latter involving loads of jumping back and forth between numbered paragraphs in a chose your own adventure game. There is also a transcription of a game session, showing the thin veil between the story level and play level of the game, including a tongue-in-cheek discussion between the players regarding if whether the things they say are heard by NPCs . The Referee book contains very little in the way of rules, instead it very clearly explains how to prepare and run a game. It is very detailed in it’s instructions, and gives lots of advice on how to run a fun game. The setting is weak, but frankly, how much do you need to go dungeon bashing? The rules are good, at least as far as I can tell, they are intended to replicate the feeling of the old D&D style games, and I think they do. The form is excellent. The tutorial and referee books together would be a good introduction into gaming for beginners, at least if they manage to stay interested in spite of the rather bland graphical presentation of the material (the text itself is rather nice). And experienced gamers unfamiliar with the old school style of gaming can learn it here. No, I don’t think so. I have left dungeon bashing behind me, the style of play where you are actually expected to map your surroundings and solve riddles doesn’t appeal to me anymore. Maybe I could run it as a gag game at a convention, but then I think I would go back to the red box D&D, just so that the neophytes could join online discussions and talk about what games were like thirty years ago. Not a bad game, but not a game for me. 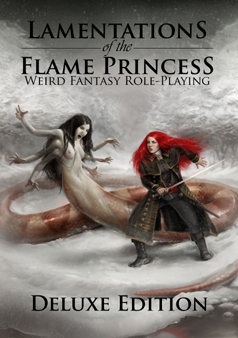 www.lotfp.com/RPG/products/lotfp-weird-fantasy-role-playing – Official site for the game.